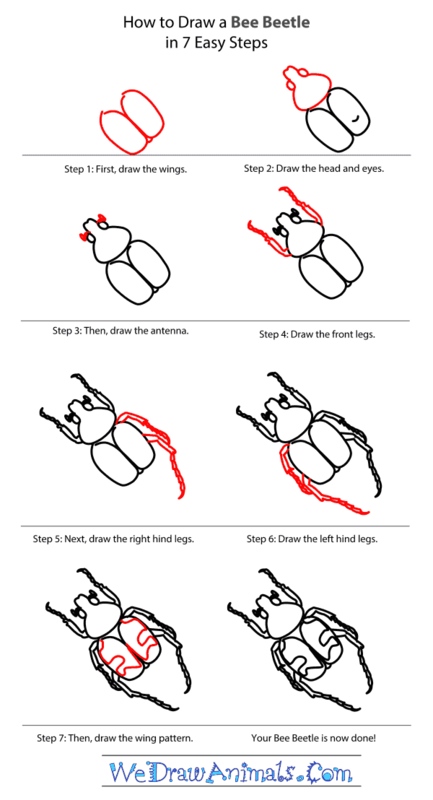 In this quick tutorial you'll learn how to draw a Bee Beetle in 7 easy steps - great for kids and novice artists. At the bottom you can read some interesting facts about the Bee Beetle. The Bee Beetle is a type of scarab beetle that is covered in yellow and black blotches. The portion of the body closest to its head is covered in brown fuzz so that when you look at one from the side, it looks a lot like a very plump bee! 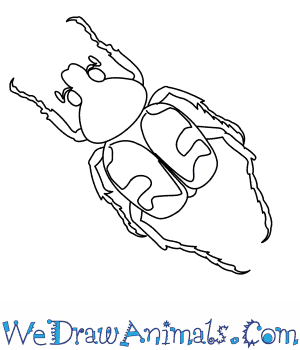 This is how the Bee Beetle gets its name. The Bee Beetle possesses elytra, which are hardened wing-coverings designed to protect the softer hind wings used for flying. Flower petals are a Bee Beetle’s favorite food. The fuzz found on the Bee Beetle’s body is called pubescence. Bee Beetles are useful pollinators. The Bee Beetle is only about 10 millimeters in length. The Bee Beetle is only found in Scandinavia and a few other European countries. The International Union for the Conservation of Nature (IUCN) has not yet done enough research to determine if the Bee Beetle is a species in danger of extinction.